~ founder and host of Crusher™TV and the award winning ADD Crusher video series. Crusher™TV is a weekly online TV hosted by "Mess to Success" entrepreneur and productivity coach Alan Brown. He and his A-List guests deliver life-changing solutions to a members-only audience. This show is meant to help the "crazy-busy" people - and who isn't crazy busy these days?!? Each week Alan and his guest experts share brain hacks and other simple solutions to turbocharge your productivity and quality-of-life: Crush procrastination. Get more stuff done. Have more free time. Just to name a few. 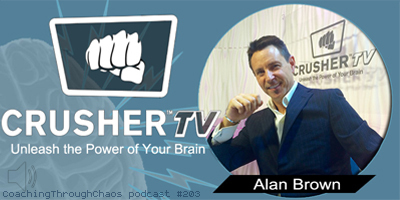 Alan teaches people how to quiet their mind AND power it up! His “Mess to Success” story. The story of how getting a diagnosis of ADD when he was 35 years old changed his life for the better. 3 brain hacks you can use right now in order to crush ADHD and become more productive. Tells us about how he became the ADD Crusher. 2 common themes in the lives of people who have trouble focusing. Why people get stifled around productivity and focus. Who can benefit from the ADD Crusher video series.